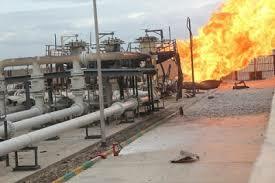 Report reaching Biafra writers desk has it that the Avengers has attacked another Chevron pipeline. This happened at 11:10pm on wednesday, 6th of July, 2016. "Between the hours of 10:50pm to 11:10pm our (Niger Delta Avengers) strike team blew up Chevron Manifolds. the manifolds are RMP 22, 23 and 24. Brothers.Brig. Gen Mudoch Agbinibo Spokessperson." The Avengers spokesperson Gen. Mudoch warned all to beware of deceivers and impostors who are set to mislead the public using fake accounts, they further urged all to always visit their website for any information as that will be their only means of communication for now. Great freedom fighters please ride on it will soon be zero production.